Identification: Page and Burr (1991). Keys and distinguishing characteristics were given by Smith (1945), Talwar and Jhingran (1992), and Kottelat et al. (1993). The identity of the fish introduced into the USA is in doubt following an analysis by Ng and Kottelat (2008), which restricted the name, C. batrachus, to fish from Java. A photograph appeared in Kottelat et al. (1993). Native Range: Southeastern Asia including eastern India, Sri Lanka, Bangladesh, Burma, Indonesia, Singapore, and Borneo (Lee et al. 1980 et seq. ; Talwar and Jhingran 1992; Kottelat et al. 1993). Laos (Baird et al. 1999). Probably introduced into the Philippines. Table 1. States with nonindigenous occurrences, the earliest and latest observations in each state, and the tally and names of HUCs with observations†. Names and dates are hyperlinked to their relevant specimen records. The list of references for all nonindigenous occurrences of Clarias batrachus are found here. Means of Introduction: The walking catfish was imported to Florida, reportedly from Thailand, in the early 1960s for the aquarium trade (Courtenay et al. 1986). The first introductions apparently occurred in the mid-1960s when adult fish imported as brood stock escaped, either from a fish farm in northeastern Broward County or from a truck transporting brood fish between Dade and Broward counties (Courtenay and Miley 1975; Courtenay 1979a; Courtenay and Hensley 1979a; Courtenay et al. 1986). Additional introductions in Florida, supposedly purposeful releases, were made by fish farmers in the Tampa Bay area, Hillsborough County in late 1967 or early 1968, after the state banned the importation and possession of walking catfish (Courtenay and Stauffer 1990). Aquarium releases likely are responsible for introductions in other states (Courtenay and Hensley 1979a; Courtenay and Stauffer 1990; Hartel 1992). Dill and Cordone (1997) reported that this species has been sold by tropical fish dealers in California for some time. Status: Established in Florida; failed in California, Connecticut, Georgia, Massachusetts, and Nevada. Impact of Introduction: Largely unknown. In Florida, walking catfish are known to have invaded aquaculture farms, entering ponds where these predators prey on fish stocks. In response, fish farmers have had to erect protective fences to protect ponds (Courtenay and Stauffer 1990). Loftus (1988) reported heavy predation on native fishes in remnant pools during seasonal drying of wetlands. Baber and Babbitt (2003) examined predation impacts on tadpole assemblages in temporary wetlands in south-central Florida, and found that native fishes (e.g., eastern mosquitofish Gambusia holbrooki, golden topminnow Fundulus chrysotus, flagfish Jordanella floridae) had larger impacts and higher predation rates on tadpoles than C. batrachus. Remarks: In 1968, this species was confined to three south Florida counties; by 1978, it had spread to 20 counties in the southern half of the peninsula (Courtenay 1979a; Courtenay et al. 1986). Dispersal apparently has occurred by way of the interconnected network of canals along the southeastern coastal region; however, spread was accelerated by overland migration, typically during rainy nights (Loftus and Kushlan 1987). Its ability to use atmospheric oxygen assists in survival in low-oxygen habitats (Loftus 1979). The walking catfish has been established in Everglades National Park and in Big Cypress National Preserve since the mid-1970s (Courtenay 1989). Populations suffer periodic die-offs from cold temperatures and subsequent bacterial infection (Loftus and Kushlan 1987); consequently, northward dispersal is limited (Courtenay 1978, Courtenay and Stauffer 1990). Although all Florida imports were originally albinos, albinos in the wild are now rare and descendants have reverted to the dominant, dark-color phase (dark brown to gray) probably a result of natural selection by predators (Courtenay et al. 1974; Courtenay and Stauffer 1990). Guarding of free-swimming young may enhance survivorship over that of native species with less advanced (or no) parental care (Taylor et al. 1984). Voucher specimens: Florida (USNM 203889, 317282, 317283, UF 16424, 93561, TU 71116, 12099), Massachusetts (MCZ 69534). Minckley (1973) indicated that the specimen taken from the All American Canal, California, was deposited at Arizona State University. Anonymous. 1983a. Spiny 'walking catfish' moving upstate, spotted in Vero Beach. Sun-Sentinel, 19 October 1983. Baber, M.J., and K.J. Babbitt. 2003. The relative impacts of native and introduced predatory fish on a temporary wetland tadpole assemblage. Oecologia 136:289-295. Baird, I.G., V. Inthaphaisy, P. Kisouvannalath, B. Phylavanh, and B. Mounsouphom. 1999. The fishes of southern Lao. Lao Community Fisheries and Dolphin Protection Project. Ministry of Agricultrue and Forestry, Lao PDR. Courtenay, W.R., Jr. 1970. Florida's walking catfish. Ward's Natural Science Bulletin 10(69):1, 4, 6. Courtenay, W.R., Jr. 1978. Additional range expansion in Florida of the introduced walking catfish. Environmental Conservation 5(4):273-275. Courtenay, W.R., Jr. 1979a. Continued range expansion of the walking catfish. Environmental Conservation 6(1):20. Courtenay, W.R., Jr. 1989. Exotic fishes in the National Park System. 237-252 in L.K. Thomas, editor. Proceedings of the 1986 conference on science in the national parks, volume 5. Management of exotic species in natural communities. U.S. National Park Service and George Wright Society, Washington, DC. Courtenay, W.R., Jr., and W.W. Miley, II. 1975. Range expansion and environmental impress of the introduced walking catfish in the United States. Environmental Conservation 2(2):145-148. Courtenay, W.R., Jr., D.A. Hensley, J.N. Taylor, and J.A. McCann. 1986. Distribution of exotic fishes in North America. 675-698 in C.H. Hocutt, and E.O. Wiley, editors. The zoogeography of North American freshwater fishes. John Wiley and Sons, New York, NY. Loftus, W.F. 1979. 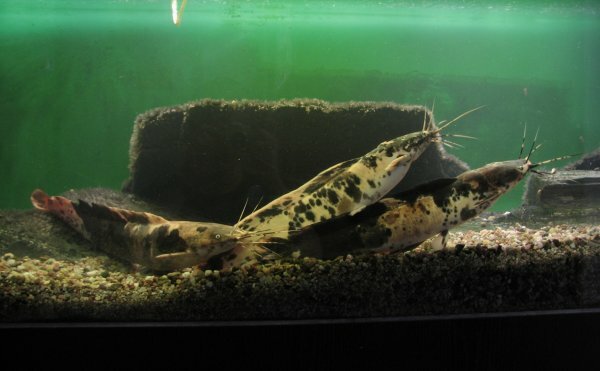 Synchronous aerial respiration by the walking catfish in Florida. Copeia 1979: 156-158. Loftus, W.F. 1988. Distribution and ecology of exotic fishes in Everglades National Park. P. 24-34 in L.K. Thomas, editor. Proceedings of the 1986 conference on science in the national parks, volume 5. Management of exotic species in natural communities. U.S. National Park Service and George Wright Society, Washington, D.C.
Loftus, W.F., and J.A. Kushlan. 1987. Freshwater fishes of southern Florida. Bulletin of the Florida State Museum of Biological Science 31(4): 147-344. Ng, H.H. and M. Kottelat. 2008. The identity of Clarias batrachus (Linnaeus 1758) with the designation of a neotype (Teleostei: Clariidae). Zoological Journal of the Linnean Society, 2008, 153: 725-732. Nico, L.G. 2005. Changes in teh fish fauna of the Kissimmee RIver basin, penninsular Florida: non-native additions. 523-556 in Rinne, J.N., R.M. Hughes, and B. Calamusso, eds. Historical changes in large river fish assemblages of the Americas. American Fisheries Society, Bethesda, MD. Stockdale, A.W. 1982. Unique catfish 'walk' to Salty Island. A Florida newspaper, 5 November 1982. Talwar, P.K., and A.G. Jhingran, eds. 1992. Inland fishes of India and adjacent countries. A. A. Balkema, Rotterdam, The Netherlands. Two volumes. Tilmant, J.T. 1999. Management of nonindigenous aquatic fish in the U.S. National Park System. National Park Service. 50 p.
Vinyard, G.L. 2001. Fish species recorded from Nevada. Biological Resources Research Center. University of Nevada, Reno. 5 p.